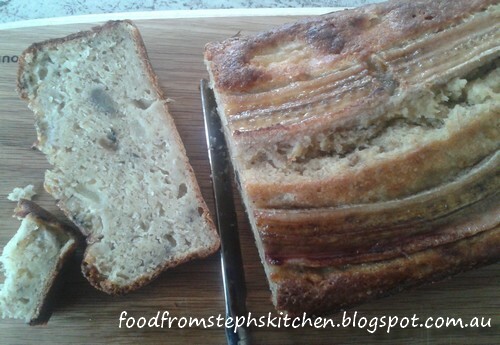 I don't know about you, but I LOVE banana bread! So when I had left over pear pieces to use I thought I'd just add them to the banana bread I was planning to make. The result was a beautiful banana and pear bread, with the pears adding bites of sweetness as you nibble your way through. Funny enough I actually only make my pear version of banana bread now. What I love the most about this recipe is the bread isn't too crumbly - so much so that I actually add it straight into the toaster like any other bread without it falling into a million pieces! This first part you will need electric beaters or mix master - just whatever you would use when baking cakes. Cream the butter/margarine and sugar like you would for any other cake before adding in your eggs, vanilla and nutmeg. Beat the mixture for a couple of minutes until well combined. Before you go any further pre-heat your oven to 160 C.
From here you can simply use a wooden spoon, as I find it easier. 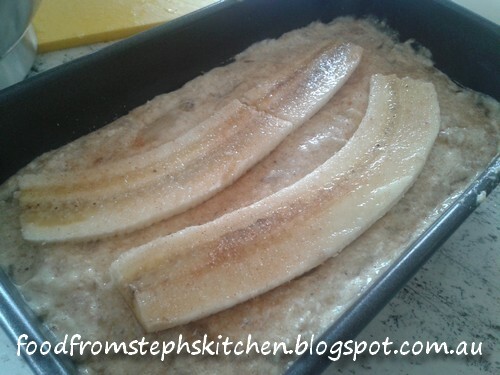 Mix through your mashed bananas (leaving your halved banana for now) and the pears. The reason why I like to mash half the pears is so that you don't just have pear pieces; I think it adds more flavour. Sift and fold through both flours until well combined. Now simply pour the mixture into a loaf tin (I used a 24 cm tin). For a very long time I didn't have a loaf tin so I used a cake tin, which worked just as well. So don't think just because you don't have one that you can't make this recipe. Honestly, it just needs something to bake in! Lay your banana halves on top before sprinkling with a little cinnamon sugar. If you don't have cinnamon sugar all it really is is a mix of cinnamon and sugar (I know, you never would have guessed) so just sprinkle a little of the two over the top. Bake in the oven for 1 hour, making sure you allow it to cool before you slice it! You can sneak a piece straight out of the oven but, like with cakes, it can crumble a little bit more.